Physics, while occasionally obscure, is really just a description of how the world’s various gears mesh. There are a few specific processes which, if you understand them, help you to understand and enjoy fountain pens more fully. Capillary action in… er… action. This is probably the primary principle in fountain pens– without it, nothing else works. Capillary action is bound up with the surface tension of liquids. Because the molecules of liquids are more attracted to each other than they are to air molecules, the surface of the liquid develops a sort of film. However, there is slightly more attraction between the solid walls of a container and the molecules of the liquid, which results in a meniscus, a slight upward reaching of liquid where it touches the walls of the container. If the walls are very close together, the attraction of the liquid overlaps and can draw the liquid through the container, stopping only when the weight of the column of liquid is such that gravity overcomes the attraction or the end of the container is reached. The walls of the slit in a pen’s point are very close together indeed. In fact, the only place that capillary action doesn’t take care of moving ink in a fountain pen is getting it from the reservoir to the feed, because in most cases the walls of the reservoir are too far apart for capillary action to defeat gravity. While it is impossible to write at length with the point above the ink, until the ink trapped in the feed is exhausted a fountain pen will happily write on the ceiling. 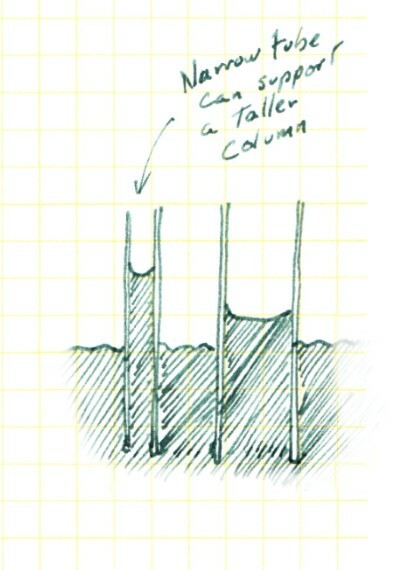 In the case of capillary-feed pens, where the reservoir itself runs on capillary action, there really is no “up” as far as writing goes. For all the capillary action that goes on in the pen, the transfer of ink to the paper is also an example of the phenomenon. As the point of the pen makes contact with the paper, the “skin” of the ink connects to its surface and causes the ink to flow from the slit to the extremities of the tipping, which extremities define how thick the line is. Because paper is made up of small fibres, capillary action also draws the ink down into the paper. This occasionally leads to the less pleasant effects of bleedthrough and feathering, and also to an ever-spreading blot if the end of the pen is left immobile on the paper, but it also means that unlike ballpoint goop, fountain pen ink is incorporated into the fabric of the paper. One last note about capillary action. I have spoken so far about how it gets ink out of a pen, but it is also responsible for keeping ink inside the pen. 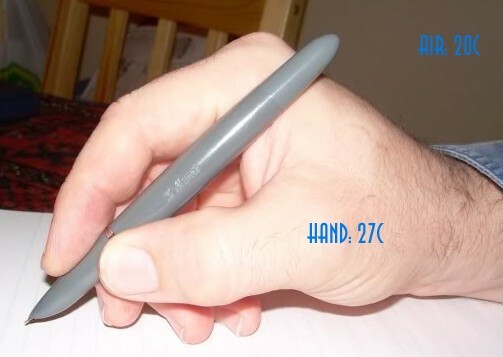 When the point of the pen is not in contact with paper, but is aimed downwards, it is the ability of capillary action to resist other forces that helps to keep the ink inside the pen. It is, as we shall next examine, not the only force that does so. While not quite the foundational principle to fountain pens that capillary action is, without a correctly governed exchange of ink for air, a fountain pen becomes a horrible mess or an inert lump. As examined above, capillary action will draw ink out of a pen without reference to any other force. I also mention above that one of the theoretical limitations on how much fluid capillary action will support is gravity. Another is air pressure; unless air enters the reservoir as ink leaves, a partial vacuum will develop inside. In fairly short order, the external air’s efforts to get into the pen will be enough to support the column of ink against both gravity and capillary action, in a similar manner to the way it keeps water in a straw with a thumb held over one end. The big fat invention of Lewis Waterman that gave birth to the modern fountain pen was a feed that would allow this exchange to happen. This doesn’t sound like such a big deal, but there’s an extra trick to it: there must be a little vacuum for the pen to work, too. In the previous example, it is very easy to get water out of the straw by removing the thumb, but it is a much more difficult thing to get a single drop; without a slight pressure imbalance all the ink will just fall out of a pen. Here’s how the trick works. When the pen is turned nose down, the feed channel is filled up, blocking air movement. 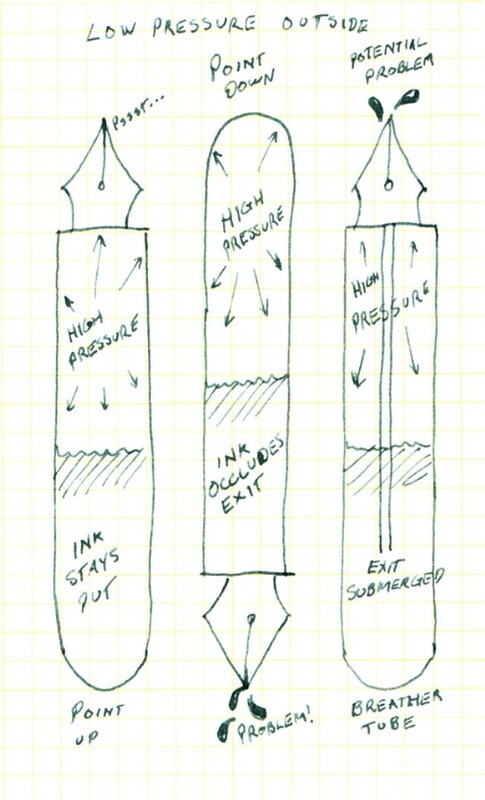 As the ink moves towards the end of the point, this movement of ink out of the reservoir creates the necessary vacuum to hold the whole fluid mass up against gravity, while capillary action ensures that there’s ink at the end of the slit by the time the point touches down. As writing draws more ink out, the interior pressure continues to fall until the point that the resistance of surface tension is no longer enough to keep the high-pressure exterior air from forcing the fluid out of the way in the broader channel of the feed. 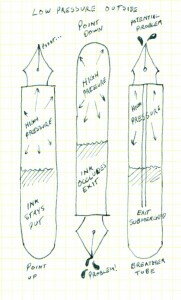 The narrow channels are a different story, since the closer walls give capillary action more say, and as the high pressure air flows up the feed into the reservoir, ink continues to flow downward, and as the equilibrium is restored between interior and exterior pressure the ink is able to reclose the feed to air. This sounds a little jerky, but consider the scale of the action: very small volumes of ink and air are involved. It is all very subtle, and in practice the pen user won’t notice it at all. All of the preceding makes a bit of an assumption that all other variables remain constant. There are a couple of variables which tend to rear their heads to discomfit the fountain pen and, potentially, the writer. Thermal expansion is the one that will come to the pen, rather than waiting for the pen to be brought to it. In general, things swell up as they are heated, be they solids, liquids or gases. There are a few exceptions, as in the case of water taking up more space as ice, but for the purposes of pens and inks in a regular working environment, the general rule holds. Heat up a pen, and it expands. Heat up ink, and it expands. Heat up air, same result. This would not be a big deal, except for one little thing: Gases expand more readily than fluids and solids (I’ll let the math-minded wander down that link to prove it for themselves). If the air in the reservoir heats up, it expands and exerts more pressure, as the ink and the surrounding pen stay roughly the same size, and the balance between air pressure and capillary action examined above is upset. Ink gets pushed out, and the writer finds drops of ink stampeding out the feed. This would also not be a big deal, if there were no heat source. Sadly, there is generally a heat source in contact with a pen while it’s in use; the human hand emits a certain amount of warmth. The hand heats the pen, the pen heats the interior air, and the air starts to get rowdy. In many pens, this is not something to worry about. If the reservoir is separated from the barrel by a little air-space, then the trapped air is insulated from the hand’s heat, and all the moreso if the barrel is ventilated. The ventilation can be a mere side-effect of the filler mechanism, as in lever-fillers with their side slots, or it can be a considered item of engineering, as in the case of Parker’s later-version “51”. Heat expansion is something to be concerned about in those pens where the barrel is a sealed chamber full of ink; in eyedropper pens, piston-fillers and bulb-fillers. Even in these, the problem is limited when the pen is full, since the amount of trapped air is small. However, as the writing proceeds, air replaces ink and the potential for expansion increases. This is especially true as the air is relatively cool and arrives in the pen ready to swell up and cause trouble, unless one is writing in a tropical location. In modern pens, this problem is mainly addressed by having a feed with enough buffering capacity to handle lots of expansion. Users of vintage pens with uninsulated reservoirs are wise to keep an eye on the feed for over-saturation, turn the pen point-up at regular intervals to help re-equalize pressure, and to not try to write their way to the very end of the ink supply. Atmospheric pressure, which was treated as a constant previously, is anything but. The constant flow of air around the planet brings with it fluctuations in the local air pressure, frequently commented upon by weather reports. However, these variations are usually not enough to trouble a pen, and if they are the writer is usually more concerned with the hurricane or tornado raging about the house than with possibly dribbling some ink. Air pressure also varies with altitude, and in this department the fountain pen user runs into some trouble, thanks to modern speed travel. Whether travelling in a plane or driving across a mountain pass, the sudden drop of pressure outside the pen can lead to a lot of ink being forced out of the pen by a trapped bubble of high-pressure air from a lower altitude. Do not, by the way, be made complacent by the notion that modern aircraft are pressurized. This pressurization gives the equivalent air pressure to 8,000 feet above sea level (roughly 2,500 meters), or about 75% of the pressure at sea level, so unless starting from a notably lofty airport cabin pressurization won’t solve anything. What will solve the problem is a little bit of planning. If travelling with pens in a briefcase, empty them. Some will advise “completely empty or completely full”, but as the latter is almost impossible to achieve, I’d leave it out of the equation. If a pen is riding in a pocket, as full as possible is preferable, but as long as it stays point up there shouldn’t be any real trouble. A pen with its point upwards doesn’t trap air in the reservoir, after all, and if full reduces amount of power any trapped air has (remembering, though, that the air spaces in marshmallows are even smaller and they react interestingly to changes in air pressure). Bulb fillers might cause some trouble, with the submerged inner end of the breather tube somewhat inverting the notion of top and bottom of the reservoir, although most also have normal channels in the feed. Once the highest point of the journey is reached, or the plane is at cruising altitude, it is safe to take the pen out and begin writing, although a little care should still be taken. Some caps seal extremely well, and pressure equalization won’t happen until the moment of uncapping, so keep the pen point up until the point is actually visible. It’s also wise to have a cloth or tissue at hand to deal with a drop or two which might come out anyway, having been lodged in the permutations of the feed.